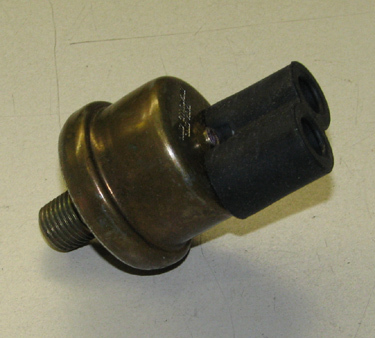 Air pressure switch for low air pressure warning and spring brake warning light. Normally open contacts close at 60 PSI rising. Switch contacts rated 5 Amps at 24 V DC. P/N 11669414-1, 12375453, alternate numbers SM-1A60RTP, PS4141. NSN 5930011890494. This switch directly replaces alternate style switch that has short wire leads with connectors on ends. All M939 series trucks have three of these switches per vehicle. Two are wired in series for the low air warning and provide one of the inputs to the fail-safe warning control unit. The third switch is behind the dash panel and controls the spring brake warning light by sensing spring brake control pressure. Switch is not for the M35, M54, or M809 series trucks. Mating electrical connector is MS27144-1.